Since Mondelez' creation in 2012, workers have known only sell-offs, closures, outsourcing, and permanent restructuring. The result has been permanent anxiety and redundancies for a workforce that has dedicated itself to Mondelez and its predecessor companies for many years. IUF affiliates LBC-NVK and BBTK protested today in front of Mondelez-Mechelen against job destruction. 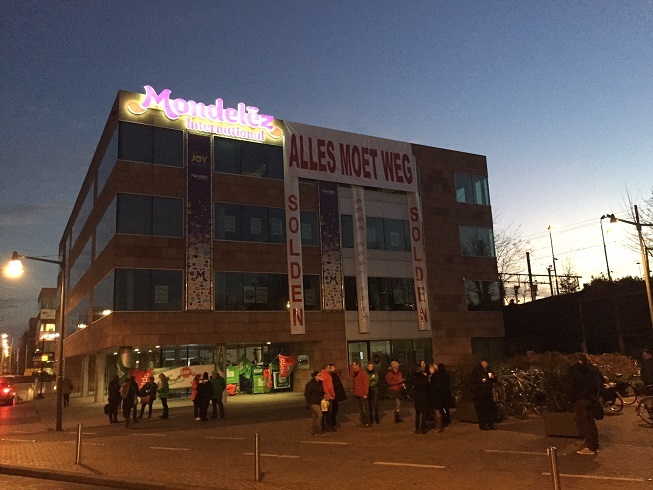 In 2015, Mondelez-Mechelen's workforce declined by 10% and will decline by another 20% in 2017. IUF Mondelez unions demand investment in the future of the company and its brands and an end to the continuous restructuring and financial short-termism which is driving the destruction of quality jobs at Mondelez. The IUF and its affiliated Mondelez unions and membership further demand immediate negotiations around all restructuring actions with affected unions.